To view the slideshow in simple blog post format, click here. In October 2015, CoLED members gathered at UC Irvine for a two day workshop. Forty participants attended the workshop, including CoLED members from six campuses, and graduate students and faculty from UC Irvine. During the first day of the workshop, participants broke into small groups to participate in an ethnocharette – a mode of collaborative, rapid engagement with an academic ethnography. Groups were arranged in advance to be comprised of a mix of grad students, postdocs, and faculty, and to include people from different campuses. For this unique ethnocharette, rather than focus on any one group member’s project, each group was asked to gather the last cellphone image captured by five campus passersby, and to analyze the collected images together as a group, using social theory and an association exercise using stock images from web data bases. Groups found that cellphone users were using the photo function on their devices for many tasks that didn’t fit strictly into the traditional category of “photography”. UCI students used “photos” to save information from lectures or homework; to build relationships with friends by text each other screenshots of moments from social media; to build a social identity on social media; and to capture memories. Few of the digital images that we collected looked like photographs as the word is typically understood. CoLEDers found both inspiration and frustration in these images collected from campus passersby, and in the bland and sterile manner of stock photos. Ethnographers accustomed to working alone were challenged by the prospect of working in groups and following a rapidly paced, highly structured process. Conversation showed that participants were challenged by the strictures of the ethnocharette format – the very kind of assignment that we often assign to undergraduates. The second day of the workshop began with a tutorial in a performative reading practice developed at UCSD called Feminist Theory Theater. …and looked fabulous doing it! Following the activities, groups were invited to share their findings for both the ethnocharette and the FTT exercises. Faculty members from different campuses, along with graduate students, commented on the collaborative presentations, pointed out themes, and learned more about one another’s perspectives and about the on-going conversations regarding ethnography on the various campuses. At the end of the workshop, participants were asked to contribute to a group brainstorming exercise to help the conference committee with the work of producing a vision for a CoLED conference in Fall 2016. A guided, rapid brainstorm asked participants to first jot down words and ideas related to different elements of ethnography, and then to arrange them according to categories on a white board. Keith Murphy, Elana Zilberg, and George Marcus closed the workshop… and sent everyone off for one last rowdy dinner before heading home to campuses throughout the state. The Formal Play workshop showcased the ethnocharette technique developed at UC Irvine by Keith Murphy and George Marcus, and the Feminist Theory Theater technique developed by CoLED graduate students Yelena Gluzman and Christina Aushana with collaborators at the Studio for Ethnographic Design at UC San Diego. 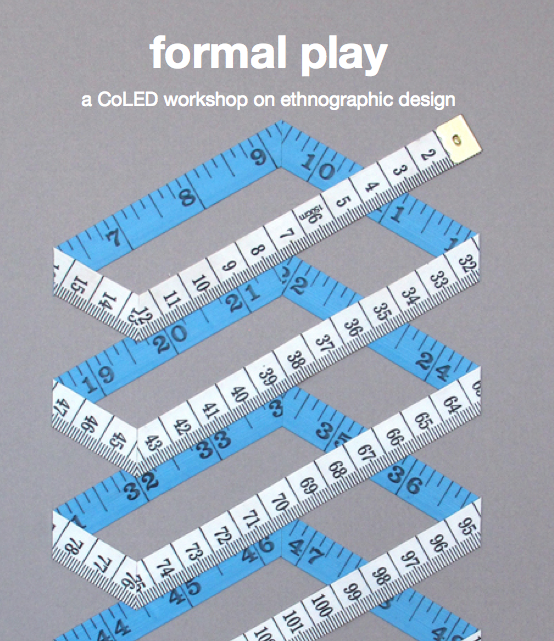 The “Formal Play” workshop was supported by the MRPI grant for intercampus collaboration through the University of California Office of the President, administered by CoLED, and conceptualized, planned, and organized by Keith Murphy and Katie Cox with support from the Anthropology Department staff at UC Irvine. Photos by Christina Aushana, Yelena Gluzman, and Cassandra Hartblay. Slideshow by Cassandra Hartblay. The next CoLED workshop will be held at UC Davis in March 2016. The CoLED public conference is tentatively scheduled for October 28-30, 2016.